We provide expert, affordable lawn care, and are well known for our friendly, caring service. We’re proud to be the local choice for professional lawn the LawnCrafters touch, you’ll save time and money while seeing your lawn and landscape reach their true potential. Our goal is to provide professional and affordable landscape maintenance service to both commercial and residential customers.LawnCrafters specializes in all aspects of lawn maintenance. We specialize in servicing various property sizes from medium size yards to the large exclusive estate properties and commercial market accounts. LawnCrafters is your local neighborhood source for total lawn care services you can count on. We offer a full menu of yard and lawn care services for you home’s exterior living space, including weed control and lawn fertilization, tree maintenance, and many other yard care services. 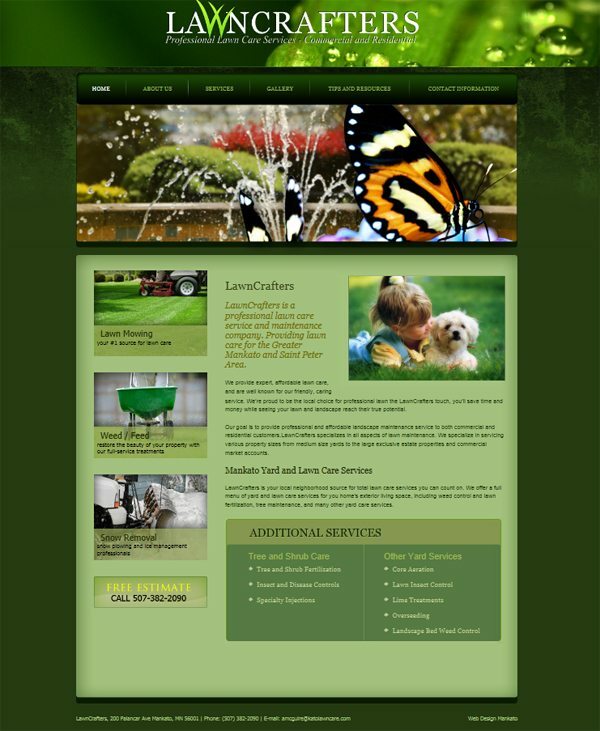 This entry was posted in Lawn Care Web Design, Web Design Projects and tagged LawnCrafters, Mankato Lawn Care, Mankato Leaf Removal, Mankato MN Search Engine Optimization, Minnesota SEO on October 30, 2012 by Ross Lund.